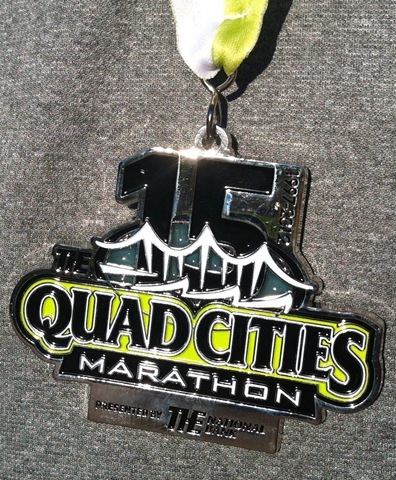 Many, many months ago, I registered for the half marathon that was part of the Quad Cities Marathon weekend. This would have been my last race before the Chicago Marathon. Many would probably take it easy with the marathon so close in sight but that’s not my style. Each and every year, I always race and run hard this weekend and it never fails to be the fastest half of the entire season. Yes, the fastest and on legs that are tired from marathon training but oh so fast and fit from 18+ weeks of high mileage. I don’t even usually have to “try” to run fast, it just happens and always leaves a smile on my face knowing that the hard work of marathon training paid off. This year has been a little different. First, I normally race the Fort 4 Fitness Half in Fort Wayne, IN because that’s close to my parents and essentially a home town race for me. 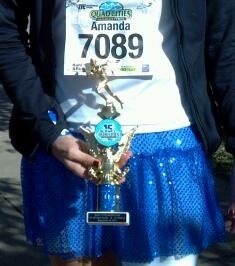 My whole family participates in the various events which range from a 4 mile run/walk, 10K to the half marathon. Its more like a party than a running event with family, friends and an atmosphere that few other races come close to rivaling. Oh, and the course is amazing too. I love Ft. Wayne! However, this year the Fort 4 Fitness Half was scheduled for the September 29th, which is only a week out from the Chicago Marathon, plus Aby has a Cross Country Invite that day, so we were out for sure although certainly not happy about it. The Quad Cities Marathon races are top notch. They give great swag and since this was the 15th anniversary, the swag was better than ever. In fact, I don’t remember ever receiving this much great stuff that I know I will be using! The 15th anniversary promised running gloves (used them yesterday morning and they rock! ), a running belt with a zippered pouch, reflectors and a blinking light, plus a gender specific long sleeve shirt that is super soft and will be nice for lounging and/or running. The expo had about 40 vendors and seemed small but most are when you are spoiled used to running races in Chicago that consistently have 35 to 45 thousand runners. Although small in size, the expo had the necessities and they gave away free beer the vendors were personable. The race itself offered a Kids Mini Marathon, 1 mile walk, 5K, half marathon, marathon relay and a marathon. Lots of choices and they were very nice about letting us downgrade our registrations to shorter races due to our injuries. Plus the various courses were well marked, had tons of volunteers support, port-o-potties, aid stations, and the traffic control was amazing. These races are all fast due to the participant cap of 5,000 runners which enables you to run your race and not get boxed in behind lots of other runners. 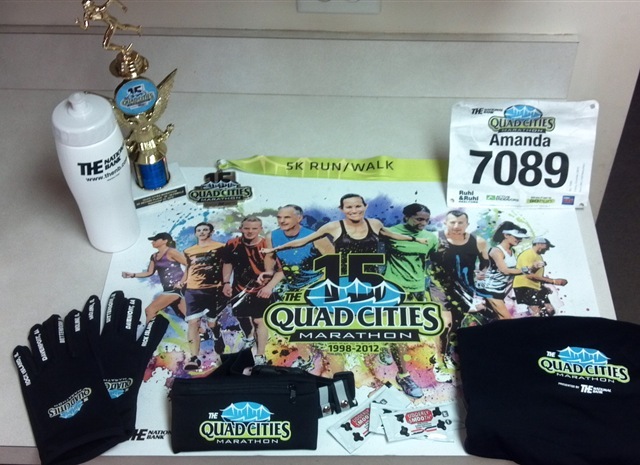 If you are looking to run fast and free, I’d recommend trying out the Quad Cities races. There really is something for the entire family. 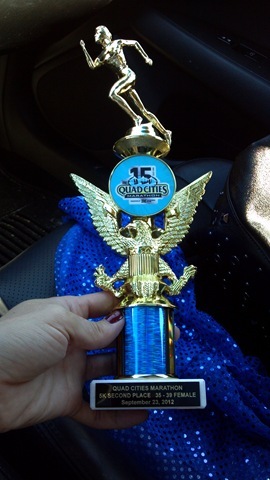 Plus they give a ton of awards so you may come home with some extra bling, I did! Although, I’m still not up to speed, I’m improving and well, most people come to Quad Cities for the half or full marathon so the 5K was a “little” light. I ran a 25:05 and that was good enough for a second in my age group. Kinda cool that they gave such nice trophies for all the races. The awards for the half, marathon relay and the marathon were even more extravagant. They even offered awesome medals to the 1 mile walkers and the 5K participants. They really made us feel a part of the process and that was nice. Here is a pic that Run With Jess took of the 5K medal. This is an amazing series of races and I would absolutely go back again. I was very concerned about the mass start with all the races beginning at once but it wasn’t a problem at all and I was able to get right out and on with my 5K race at the pace that I could manage wanted. I was never trapped or boxed and was across the start line within 20 seconds. I love the Quad Cities and all that they offer. I enjoy the atmosphere of these races and the little touches like on course wet sponges and oranges, and the great finish line party with on hand chiropractors and massages therapists, tons of snacks, water, chocolate milk, Pepsi, pork chop sandwiches and FREE BEER. They were very generous with all the complimentary post race items and didn’t even take the tags from our bib. Thanks Quad Cities for another great race. I’ll definitely be back! 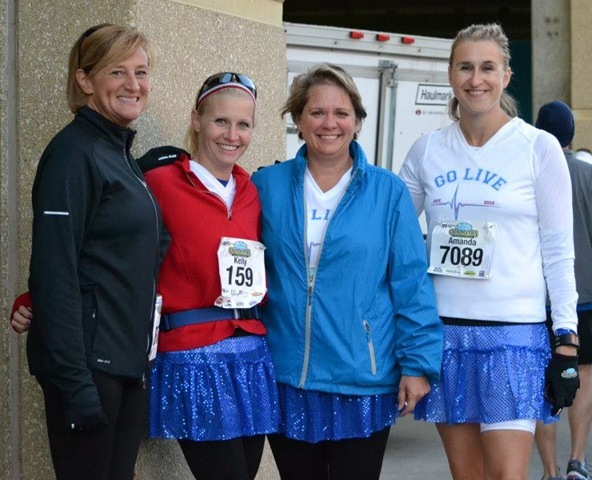 This entry was posted in Race Reviews, Running and tagged Fort 4 Fitness, great race, Half Marathon & 5K, Quad Cities Marathon, Racing, Running, Running in the Quad Cities by tootallfritz. Bookmark the permalink. Congrats on the win! Great work. Sounds like an amazing weekend, job well done! Quad Cities is such a top-notch event!! Congrats on the trophy & so happy to see you there! I loved seeing and talking with you too! We definitely need to plan a get together! I love to see Joan and Julie too! We were just in the Quad Cities for a wedding at the beginning of the month and it made me think I would really like to run there! Its nice. They have the Bix 7 in the summer too that I’d love to try but I feel like its close to a holiday and that is problematic for me. I need to look it up.